I LOVE bubbly. 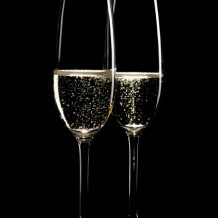 I am partial to expensive French bubbly, but there are some really good and affordable non-French sparkling wines that can light up my taste buds (and yours, too!). The sparkling wines listed below are perfect for your holiday celebrations and many are surprisingly affordable! Try serving sparkling wines with any seafood dish (caviar and Sushi are two of my personal faves! ), salads, brunch fare or, just enjoy it on its own! Cheers! OMG! What a fantastic sparkling wine! Spicy aromas of cinnamon toast, clove, allspice, toasted almond, citrus peel and a dab of butter delight the nose and continue as flavors in the luscious, effervescent mouth. Anyway…this wine is delicious! It’s zippy, zesty and fruity and only $10.99! Aloha! Aromas of tropical fruits and flowers are enhanced by yeasty, toasty notes. The mouth is crisp and clean, yet rich. This is the perfect bubbly to drink on a beach with your favorite pool boy. This refreshing Spanish sparkler is spicy, racy and complex. It’s loaded with aromas and flavors of cinnamon, allspice and green herbs. Picture Antonio Banderas, lounging in the herb garden, wearing nothing but a cinnamon-dusted matador’s cape and you’ll be with me on my happy little Wine Wench planet. Sassy Spanish sparkler! Try saying that one five times, fast. Grin. This wine is crisp, complex and well balanced, loaded with aromas and flavors of green apple, tropical fruit and tropical fruit, all wrapped up in a vibrant, juicy mouth. ¡Que delicioso! In other words, yum! Another stellar Spanish sparkler from Segura Viudas! This wine abounds with aromas and flavors of citrus peel, green herbs, green apple and mineral notes. And the bottle is really cool, too.